If you ever go to a new grocery store with me, you should probably expect to be there for a couple hours. Going grocery shopping is awkwardly one of my favorite things to do. Nothing makes me happier than spending time in an organic food store or market and getting lost in the aisles, discovering new products and trying new things. I am like a kid in a candy store! When we travel, I make a point to go to each and every Whole Foods in the area. I love seeing local items and just finding my favorite brands for stocking up when I am away. I get to see those delicious new drinks that everyone in LA is posting about but isn’t yet distributed to the east coast. Or the dark chocolate bars I have been itching to try! I also oddly enjoy comparing the prices and seeing if they are the same or different back home (nerd alert). This hobby of mine definitely has come in handy when it comes to being a recipe developer in the healthy food space. I am constantly on the hunt for new products that I can bring home to my kitchen, taste and test. Then of course share with you guys! There are so many amazing brands continuing to innovate and create these new and epic products each and every day. It can be intimidating to most people to figure out what to try and invest money on. Those $10 bags of granola add up, let me tell ya! What is actually in this bottle, package, box, etc.? I remember when I first saw REBBL, my favorite elixir and protein beverage on the grab-and-go shelf. I saw these bold, slim bottles with bright colored labels and was instantly drawn to them. Saw the dreamy flavors like “Reishi Chocolate” and “Turmeric Golden-Milk” and assumed it would be filled with random ingredients. 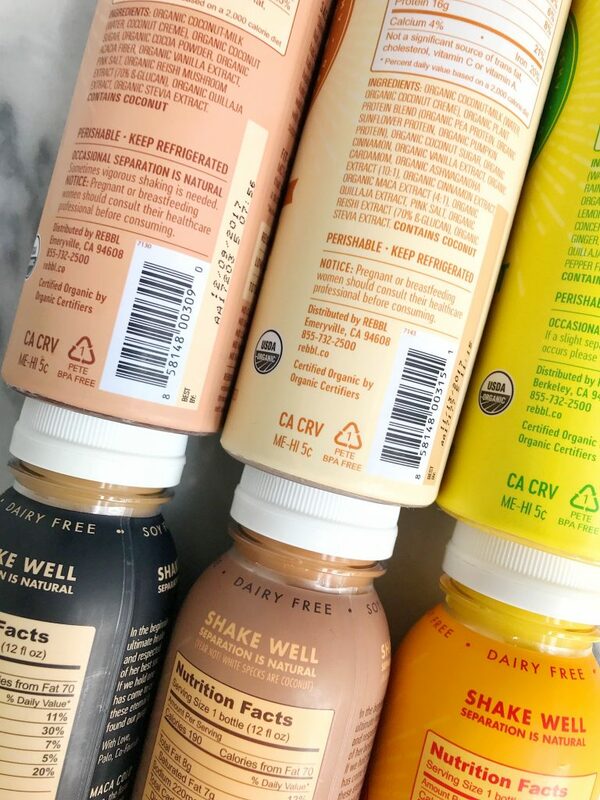 But I turned over the label and saw they are an organic coconut milk based beverage and each flavor is made from REAL and organic ingredients. Their Reishi Chocolate is made from organic coconut-milk, organic coconut sugar, organic cocoa powder, organic acacia fiber (a resistant starch prebiotic to improve efficiency for us to absorb nutrients), organic vanilla extract, pink salt, organic reishi mushroom, organic quillaja extract (natural emulsifier) and organic stevia extract. No corn syrups, heavy creams, refined sugar, nothing! All whole and real ingredients and certified organic. Plus they are all filled with adaptogens, herbs I had been wanting to try and incorporated into my diet before I had found REBBL. They use maca and ashwagandha as well. I picked up a bottle and was hooked (Reishi Chocolate!). I will pretty much try anything if I can pronounce the ingredients and they are all something I am comfortable with. It’s important we each have our own ingredients we are and aren’t okay with, everyone is different! I personally like to shy away from corn syrups, artificial sweeteners, artificial colorings/additives, GMO-canola oil, just to name a few..
What’s the nutritional label looking like? I know what you are thinking and the answer is no. I do not count calories/macros/anything. That ISH messes with the head. Instead I like to look at the nutritional break down when it comes to the added sodium and sugar looking like? I like to be aware if something I am eating will have more salt than I usually consume at home. Or if there are any serving size recommendations. I’ll tell you what, I buy so many drinks and down the whole thing in an hour or less than look at the back and see the label says “two servings”. Well that’s awkward because I never get two servings, more like one. 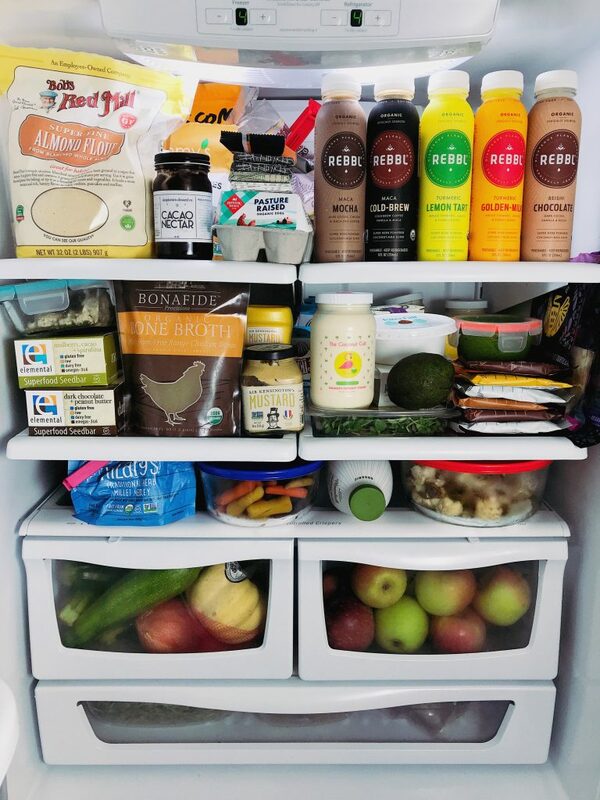 When I looked at REBBL’s labels I saw that they’re filled with healthy fats (something I like to consume a lot of in my daily eats). I love that some flavors have a great amount protein like the Vanilla Spice Protein with 16g of protein. The Turmeric Lemon Tart has 7g of fiber and the Maca Mocha has 8g of fiber! It is crazy to see we can get this from a drink, and it is one serving – holla. No, I don’t sit in the aisles googling the company’s founders and background! But if it is a brand I find myself consuming often and buying each time I am at the store, I start to become curious about the people behind the brand. Where was this product even made? Who works there? I learned that the CEO of REBBL was female and was honestly so inspired by that. I love seeing strong and empowering women leading as the CEO of this epic brand. I learned Sheryl O’Loughlin was the former CEO of Clif Bar, and I also learned more that the brand was actually born out of a non-profit dedicated to eliminate human trafficking in vulnerable areas around the globe, and they continue to give 2.5% of sales back to the Not For Sale to support their mission. It makes me want to support the brand even more! And I feel honored and proud to even drink it, because I know I’m helping them give back. Most of my readers and followers just assume I don’t pay for my food and beverages. And while I am very grateful to be receiving many wonderful products for free as a part of my job , I do buy a lot more than you might think. I am pretty cautious when it comes to spend and overspending. I am all about investing in your health but I am also realistic. I don’t want to spend $20 on a dark chocolate bar or $4.99 lb on apples (even though sometimes the Honey Crisps are too good not to). I love when brands are providing good quality products at solid prices. Granted, pricing can vary from store-to-store, but for the most part it is within a few dollars. REBBL can be found for around $3.99 per elixir or $4.69 (on average), and I find them on sale often. For a certified organic product with superfoods like adaptogens and other sustainably-sourced ingredients, I expect to spend a couple dollars more than an average conventional tea. 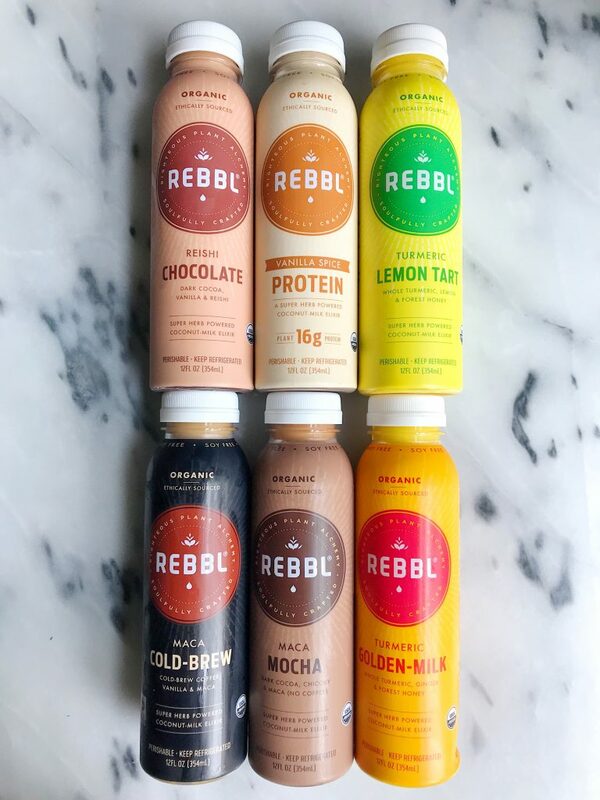 I know I like to invest my $ in products like REBBL because I enjoy the taste and feel like I am fueling my body with goodness at the same time. See? My steps to review products aren’t too crazy. These are the four main things I look at when I find new products and shop for them. I try to leave an open mind, try new things and you’ll never know what deliciousness you’ll find! That’s how I found REBBL! I LOVE new grocery stores LOL!